Megan Hill takes you on a tour of wacky attractions that add a little mystery to the U.S. interstate system. For hours we passed the billboards: “The Thing? The mystery of the desert” and “The Thing? What is it?” and finally, when my friend Leigh and I arrived at the exit in the middle of Arizona off Interstate 10, curiosity had gotten the better of us. We sheepishly handed over the $1 entry fee and began a strange and entertaining walk through my first roadside attraction. 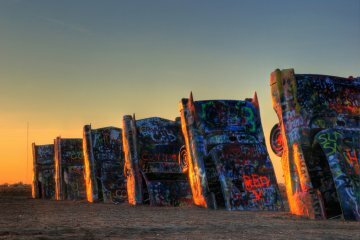 If you have the time and a sense of humor, here are 10 bemusing, tacky roadside attractions, all easily accessible from interstates, to check out on your next American road trip. 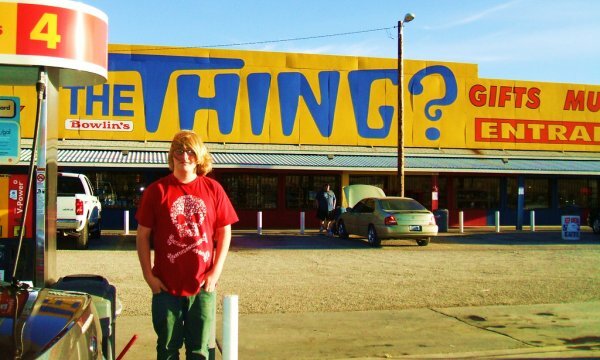 Some 250 signs for 200 miles along I-10 through the empty Texas desert invite you to visit “The Thing?” 40 miles outside of Tucson. The identity of “The Thing?” Sorry, you’ll have to find out for yourself. This historic tourist attraction breaks up the drive across South Dakota on I-90. Like “The Thing?,” it also entices would-be visitors with billboards beginning hundreds of miles away. Wall Drug’s mall employs nearly one-third of the town and is famous for its huge jackalope, mechanical people, and 80-foot dinosaur next to the interstate. The 80-foot cement whale is a bizarre anniversary gift that can be seen from former Route 66 next to its pond. It’s easily accessible from I-44 outside of Tulsa. Visitors can actually walk into the mouth of the giant sculpture. Created in 1974 by members of the art group Ant Farm, this installation involves 10 spray-painted Cadillacs emerging from the ground tail-end up. It’s visible from I-40 but if you plan to stop, bring a can of spray paint; Ant Farm encourages visitors to add to the artwork. 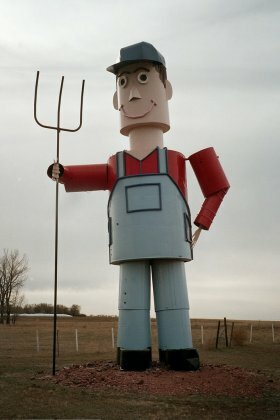 This 55-foot statue welcomes visitors to Blue Earth at the midpoint of I-90 in Minnesota. 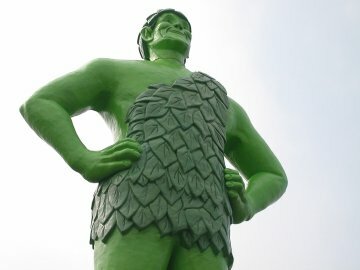 The Giant commemorates the town’s link to the Green Giant Company — once located there and formerly called the Blue Earth Canning Company. Outside of Barstow on I-15, this former silver mining town is now a tourist attraction. There are several options for entertainment, including mine tours, gunfight shows, and gold panning. Only five original buildings exist today; the rest are re-creations. Curiously, there’s more than one roadside attraction involving a jackalope. Douglas has one because a resident of the small town dreamed up the imaginary creature in the 1930s. You can access the town and its statue off of I-25. In downtown Hartford, this museum houses a strange collection of taxidermic items, including exotic birds, an eight-foot alligator, a two-headed pig, and a two-headed calf. Off of I-5 in Oregon, this attraction claims to be a “whirlpool of force” where strange things happen. The vortex apparently defies the laws of physics: balls roll uphill, and people appear shorter as they approach you or taller as they walk away. Turn off I-94 at Gladstone, North Dakota, for 32 miles of weird, oversized art installations including a tin family, the world’s largest grasshopper, and a flock of pheasants with a 40-foot-tall, 70-foot-long rooster. To find other curious roadside attractions on your next road trip, visit the website of Roadside America. Most of the above attractions qualify as cheap entertainment. To learn how to save on other aspects of your trip, make sure to read 8 Ways to Save Money on a U.S. Cross-Country Road Trip. I needed to see for myself what’s going on at Standing Rock. Here’s what I found.